All 1964–1974 Pontiac GTOs used some version of what we now refer to as the “traditional” Pon­tiac V-8. It was produced from 1955 through 1979 and a modified version continued for another two years. By the time the GTO rolled around, the Pontiac V-8 had a decade of improvements under its belt and a special version of the venerable 389 was developed for use specifically in the GTO. 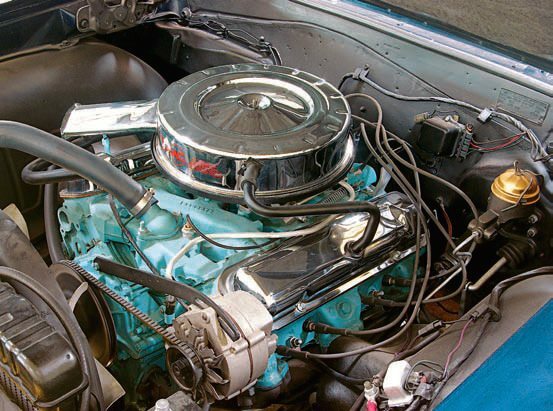 It featured cylinder heads from the 421 HO and a special cam­shaft designed to provide additional top-end power. Both 4-barrel and Tri-Power versions were offered with horsepower ratings of 325 and 348, respectively. 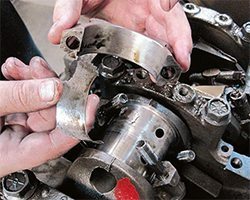 Achieving a factory-correct engine restoration with all stock equip¬ment and finishes is no small feat, but it’s something you can cer¬tainly accomplish. 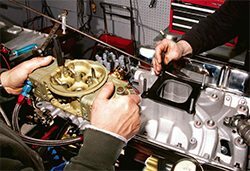 Unless your GTO is 100-percent complete and original, it may take some time to get all the required parts. With some research, patience, and skill, you can get it all “correct.” In the case of this 1969 GTO convertible, no expense has been spared to correctly restore this engine and the engine compart¬ment; it’s as close to perfection as any. The engine paint, valve covers, air cleaner, accessories, hose clamps, and other equipment are all correct. But the restorer didn’t stop there; the date codes on the hoses, belts, and plug wires are correct for the build date of the car. As the years passed, displace­ments and horsepower ratings increased the base 389 grew to 400 ci, with new, freer-flowing cyl­inder heads. Optional round-port heads debuted in the 1968 Ram Air II. A 370-hp Ram Air IV was intro­duced for the 1969 and 1970 model years. An optional 455-ci engine also entered the line-up in 1970. A low-compression 455 HO replaced the Ram Air IV in 1971 and both the 400 and 455 remained in vari­ous versions until 1974 when they were replaced with a new 4-barrel version of the 350, which was used for just one year. It was rated at 200 net horsepower. The engine currently in your GTO may or may not be the original engine that was installed at the fac­tory. Perhaps your car came without an engine altogether. 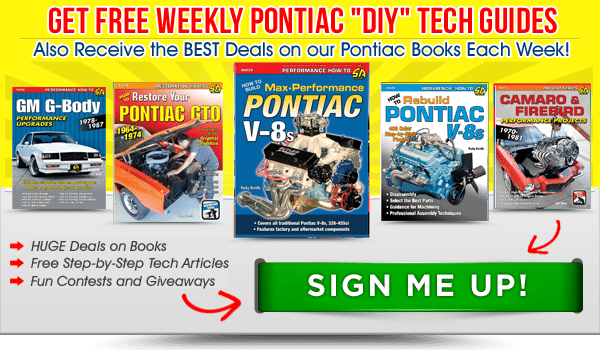 Whatever your situation, this is a great time to build a Pontiac engine. Why? Because you can benefit from a level of after­market support for the Pontiac V-8 engine that is truly remarkable. My intention is to outline some ideas for rebuilding your engine to take advantage of this support while still maintaining the spirit of the original. As street performance engines, Pontiac V-8s were among the best available. They boasted a generous displacement, fantastic low- and mid-range torque, and a responsiveness that left many race-inspired mills at the starting line. For the street racing movement of the 1960s and 1970s, most “competition” was stoplight to stoplight, so a big, torquey V-8 like a 400 or 455 Pontiac with a lot of low-end grunt was the usual winner in a short distance over a more high-strung engine like a Boss 429 or a 426 Hemi. Give either of those engines another block to rev up, and it was a different story. This 389 Tri-Power from a 1965 GTO is ready to be disassembled and rebuilt. Visually examine the block and look for any cracks or damage in the cast¬ing. Look for any carbon deposits between the block and the head because that could indicate a head gasket failure. That could mean there’s serious inter¬nal engine damage, such as scored pistons and cylinder walls. 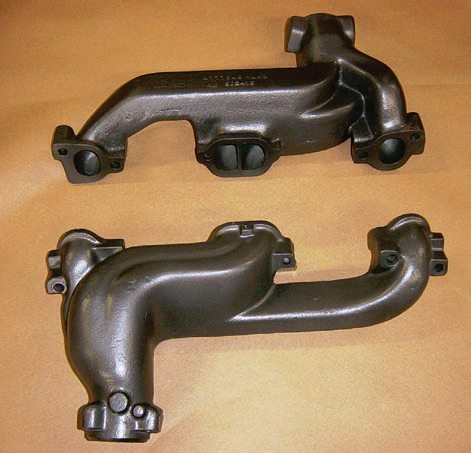 In addition, look at the intake and exhaust manifolds for any cracks, breaks, or other obvious damage. The Pontiac engines are street-oriented performance engines, while the Boss 429 and 426 Hemi are race-oriented engines used on the street. General Motors left sanctioned rac­ing in 1963, so only street perfor­mance could be offered. For that purpose, the Pontiac V-8 fit the bill admirably. Today, those same characteristics of responsive street performance can be easily integrated into your GTO and substantially upgraded, whether it is for a restoration-style build or something a little hotter. 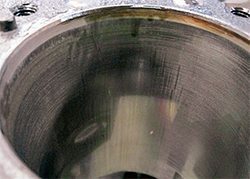 Better bottom-end componentry, freer-breathing heads, computer-designed camshaft profiles, and more efficient exhaust systems can greatly increase power and reliability without disrupting the external appearance of your engine. Over the past 20 years or so, the popularity of the muscle car move­ment generated a lot of interest in Pontiac engines. After all, they pow­ered the GTO, the original muscle car. 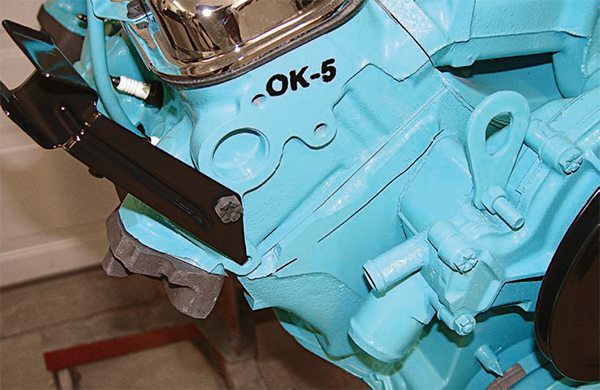 The aftermarket responded, first with intake manifolds, then cylin­der heads, then a Pontiac-based race block, then forged-steel stroker kits all amazing developments, consider­ing they are currently supporting an engine family that has been out of OEM production for three decades. In fact, it is now possible to build an entire Pontiac V-8 engine in displace­ments of 600-or-more cubic inches without using a single original part. This is further proof that while there aren’t any new Pontiacs being made anymore, there is a very strong and loyal fan base, which helps keep interest and values up. If you are considering an engine rebuild, I assume you are not looking to build a mega-dollar race engine for your Goat. Instead, you probably already have an engine that will be pressed into service for this project, and you are looking for something reliable, powerful, and not straying too far from what the Pontiac engi­neers envisioned. What if I told you that your 389 could become a 453, your 400 a 468, or your 455 a 474, all while still look­ing 100-percent stock and not cost­ing significantly more than a stock rebuild? It is all possible from the magic of a stroker kit. 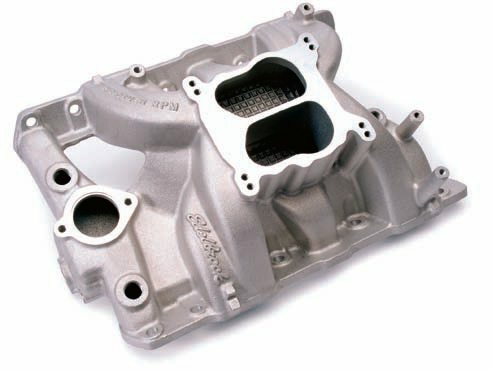 By retaining the standard production Pontiac engine block with nothing more than a standard prep and clean-up overbore, the addition of a new bal­anced rotating assembly with forged pistons and rods and your choice of a cast or forged 4.25-inch stroke crankshaft, you can reap the benefits of up to a 1/2-inch stroke increase with much more durability than the stock cast pieces. If you add a set of free flowing heads and a more aggressive cam­shaft, you could easily put out 525 or more completely streetable horse­power and have an engine that really lives up to the legendary status of the GTO. Several reputable com­panies can help you find the right combination for your specific block, including Butler Performance and SD Performance. 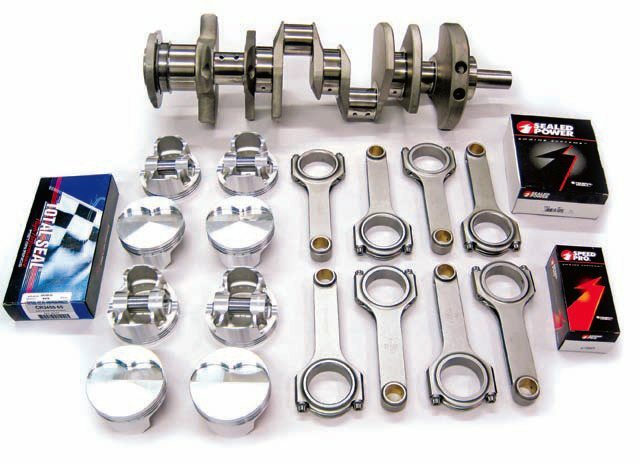 Even if you aren’t planning on a big jump in displacement, there is no longer any reason to reuse the stock cast connecting rods (PN 541000) in your Pontiac V-8. While they are fine for driving to the grocery store, they should not be considered high-performance items, even though they were installed in all factory GTO engines. Why build in a weak link? By the time you rebuild them and add new bolts, you could buy brand-new forged-steel connecting rods that are light years ahead of the production pieces in terms of strength and overall durability. Yes, you can purchase new forged steel connecting rods for under $300, so why use the stockers? The same goes with pistons. There are so many good forged pis­tons now that a stock-style cast piston is not worth bothering with. Prices have dropped over the past several years, while quality and selec­tion have improved. The truth is, most engines being rebuilt for stock restorations are not stock on the inside and that is a good thing. 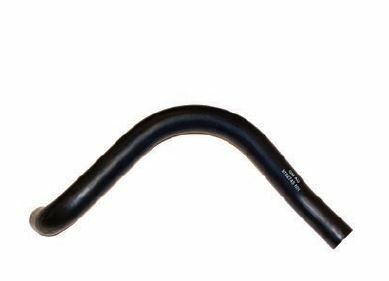 With inexpensive and, more importantly, superior-quality inter­nal parts being manufactured these days, most purists have come around on aftermarket pieces. If you can build more strength, durability, and reliability into your restorations and save money while doing so, it is fool­ish to rely on inferior, metal-fatigued originals. The Pontiac V-8’s high level of interchangeability did wonders to reduce production costs over the years, and it also went a long way to help shade-tree mechanics get their cars back on the road after a major failure. With an afternoon’s worth of work a blown-up 389 could be replaced with a later 350, 400, or 455. This could quickly put an ail­ing car back in service, but this ease of swapping engines also made for a lot of non-original GTOs. Add to that the fact that many blown-up factory engines were replaced under warranty with service replacement blocks, and finding an original, numbers-matching GTO is not easy. Fortunately for us, this is not a para­mount concern but if you are inter­ested in finding out whether the engine sitting between the frame rails of your GTO is the factory-installed original, read on. Identifying a Pontiac engine is not difficult. 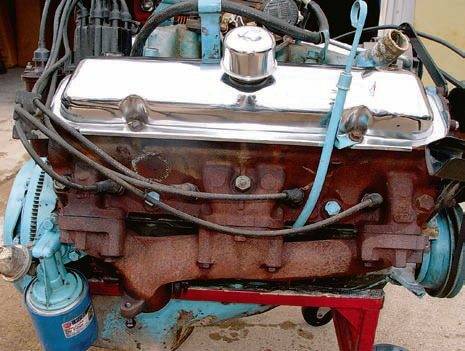 What becomes signifi­cant to many restorers is whether the original engine is still in the car. How that is determined is by a care­ful examination of the various codes on the engine’s major castings. Check the engine ID number against the VIN to determine if you have a numbers-matching car. If you do, it’s much more valuable. However, even if you don’t, that doesn’t mean the car isn’t worth restoring. A GTO with a replacement service engine, a different Pon¬tiac V-8, or a crate engine is certainly worth restor¬ing, but it’s just not going to be worth as much. 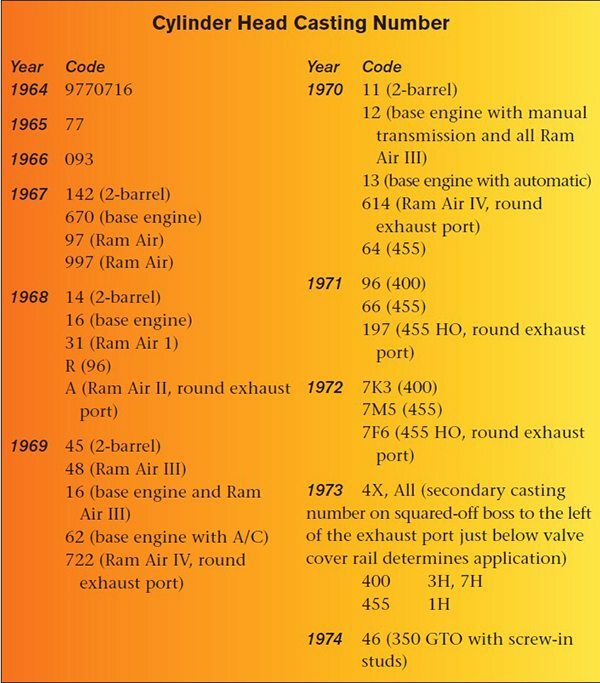 The following is information about the casting numbers of engines originally available in GTOs from 1964–1974. 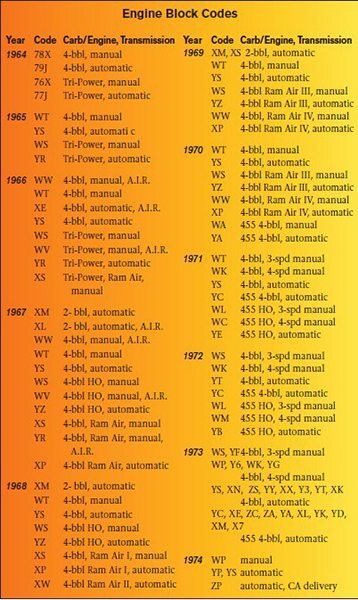 Obviously, Pontiac listed many other codes for other appli­cations, but these are the ones that GTOs originally came with. Also, keep in mind that codes were re-used and could have completely different applications assigned to them. This is why these codes all have to be cross referenced against the date code and the block casting number. Otherwise, you cannot verify the engine’s fac­tory configuration. For example, the code YS could be a base-engine 389 4-barrel used with a 2-speed auto­matic or a 1970 400 Ram Air III used with a 3-speed automatic. This number is found at the rear of the block. For the 1965 through early 1967 model years, the date code and casting number were both located near the distributor hole. From March 1967 on, the casting number moved to the area between the number-8 cyl­inder (passenger side) and the transmission/bellhousing mount points. 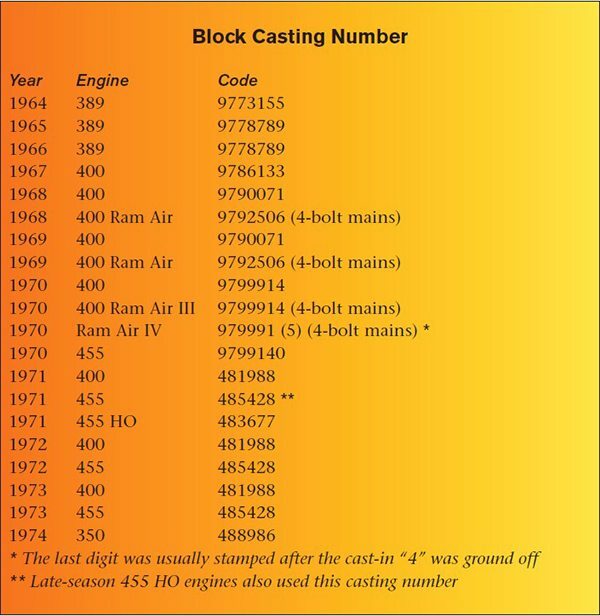 For the purposes of identifying origi­nal engines, this book lists the correct block casting numbers for original engine installations for 1964–1974 GTOs. If your casting number does not appear in the list, it is almost cer­tainly not an original engine. The date code is represented by a letter, followed by two or three num­bers. The letter designates the month of the casting A is January, B is Feb­ruary, etc. The next one or two num­bers representthe day of the month. Days before the tenth are usually not given a placeholder zero. The last number represents the year, the year of the casting date, not necessarily the model year. An early 1964 GTO may have a late 1963 build date, and if so, the engine casting date reflects that. The engine date usually pre-dates the build date of the car (as seen on the cowl tag) by as much as six weeks, though that is certainly not an abso­lute. In some unusual cases, when bodies were put in storage weeks in advance, the engine casting date could be later than the build date on the cowl tag. Blocks may also tell you whether they were cast during the day or night shift and in some years they also list the hour with a clock cast in. Block codes and engine ID num­bers are found on a machined pad on the front passenger side of the block, next to the water pump housing, just below the leading edge of the cylin­der head. In most cases, the block VIN and the vehicle VIN were the same, but by late 1967, the block VIN was revised. It started out with a 2 (for Pontiac), the last digit of the year, and a letter for the assembly plant fol­lowed by the last 6 digits of the vehicle VIN. The block code is a two or three-character stamping that identifies the engine version, the transmission, and sometimes other information, such as air conditioning, California, or high-altitude delivery zone. 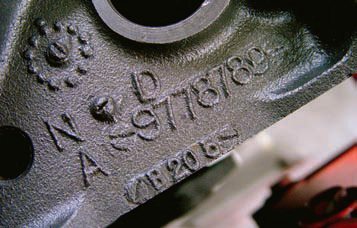 This number is usually a raised cast-in number or alpha-numeric code located on the center exhaust port of the cylinder head. In the 1965 GTO, the code was on the far right exhaust port, viewing the head from the exhaust side. 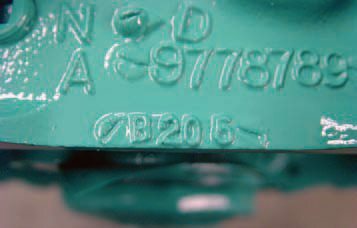 Date codes are also used on cylinder heads and intake manfolds, following the same coding system. This can be helpful determining whether the heads are original to the block. For updated information on mod­ern assembly techniques and compo­nents, Rocky Rotella’s CarTech book, How to Rebuild Pontiac V-8s, is an authoritative guide on the subject. 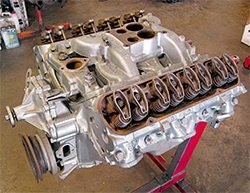 Selecting a machine shop to han­dle the preparation of your Pontiac engine is a little easier said than done, though with the addition of some common sense, you will be able to make the right decision. Just because your friend had good luck with a shop that bored out his 350 Chevy, doesn’t necessarily mean that it’s the shop for you. It also doesn’t necessar­ily rule it out either. Word of mouth is, in my esti­mation, the best way to find a good machine shop in your area. In years past, I have had good luck by going into the pits at a drag strip and talk­ing to Pontiac racers about their engine builds and who did their machine work. Time and time again, I was able to pick out one or two good shops within a 100-mile radius. Today, finding that sort of infor­mation is another reason to be on the Internet. Logging onto the various Pontiac message boards and starting a discussion thread like “Looking for a good Pontiac machine shop in Kan­sas,” usually gets the names of com­panies that can do the job. It’s also a good idea to check with Pontiac parts suppliers for their recommendations. Places like Butler Performance or SD Performance also pass along the names of customers in your area who will agree to talk to you for recom­mendations. This is also one of the great things about the Pontiac hobby that you will come to appreciate the people are great, and most are more than happy to help out a fel­low Pontiac enthusiast and/or owner. Once a shop has been chosen, be sure to talk to them in detail about what you want done and what you do not want. Have them walk you through the entire process you are paying for from beginning to end. The idea is to avoid any surprises, such as decking the engine and hav­ing all of the factory-stamped infor­mation obliterated. If that happens, the block ID that makes your car a numbers-matching example has been ruined and the car is worth dramatically less. Will they be hot-tanking the engine? How many steps does a clean-up overbore entail? How are valve jobs done? Will they be installing hardened valve seats? Will the combustion chambers be cc’d? Once the ground rules have been laid down and a price is agreed upon, be sure to photograph every marking on every piece that you are sending off to be machined. It wouldn’t hurt to mark your pieces on a non-visible and unmachined area and let them know that you did so. Show them the marks so they can keep track of your items. Just as with the rest of the car, once an engine is apart, some sur­prises can pop up, even in a running engine. 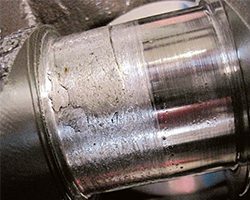 When parts are Magnafluxed, sonic-tested, and pressure-checked, problems can arise. Remember, you are dealing with castings and rotating assemblies that were built during the Johnson and Nixon administrations. Many components and problems could have occurred over the ensuing years. Maybe it was that overheating back in 1981 or that time it was over-revved in a street race in 1986 that did it in. In any event, the decision has to be made repair or replace? If you do happen to have an orig­inal, numbers-matching GTO, there is no doubt your overall investment is enhanced by keeping it that way. If that means locating a correct, dated-coded cylinder head to replace the cracked original or tracking down previous owners to see if they still have the original carb, then take the time to do so. You might be surprised with what you find. This 1965 GTO and its 389 Tri-Power were restored in the late 1980s. The classic 389 Tri- Power in this car is correct in most areas, which includes the fasteners, hose clamps, and plug wires. However, there is one glar¬ing problem the engine is the wrong color! This Pontiac shade of silver blue was first used in 1966 and lasted through 1970. This is a car of pedigree so all of the finishes should be factory correct, especially the engine-block color. Therefore, this 389 should be repainted in the correct 1965 Pontiac blue paint color. While the engine may have been painted this later color for personal preference (and it does look attractive), most purists see it as a waste of effort. But it would be relatively easy to pull the engine, place it on an engine stand, mask off all the parts, and paint the engine the correct color. Another older restoration, this 1964 has several minor mistakes or non-original equipment items under the hood. These include the belts, hoses, fasteners, and fin¬ishes. The block and manifold are also painted. The master cylinder inspection cover was spray painted gold, which is incorrect but generally presentable and fine for a driver-quality machine. There are also enthusiasts who pull out and store the original drive­line, then build replacements so they can race the car without worry of risk­ing damage to the original engine. Most competitions, such as the annual Muscle Car Shootout in Stan­ton, Michigan, or the Factory Appear­ing Street Tire (F.A.S.T.) Series, do not require an original powerplant. F.A.S.T. allows for a whole host of modifications, while the Muscle Car Shootout requires the cars to be stock and correct. Either way, it is an option that not all builders fully explore. If the original engine is gone, you actually don’t have the burden of keeping it numbers-matching and you can then explore other avenues. There is one point I want to make perfectly clear: Locating a replace­ment engine does not require it to be an original GTO engine. 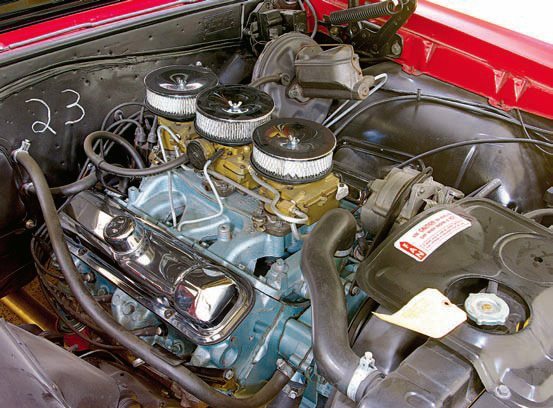 For exam­ple, let’s say your original YS-coded engine is long gone from your 1966 GTO. You can get almost the same exact engine in a much less expen­sive YE- or YF-coded 389 4-barrel out of a 1966 full-size car. What are the differences beyond the codes and casting numbers? A slightly milder 066 cam instead of the 067, and 1/4 point of compres­sion, the total of which is 10 hp and 2 ft-lbs of torque less a power level easily recaptured in a performance rebuild and a whole lot more, if you plan ahead. If you aren’t concerned with the fact that a sharp-eyed Pontiac fan might notice that your cylinder heads say “092” instead of “093,” it is a much more cost-effective way to go. 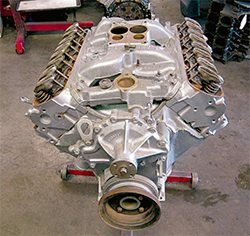 Where a rebuildable, correctly coded engine for a GTO can run in excess of $3,500, a similar engine from a full-size car may be in the $500 to $750 range. Whether the additional cost of a correct engine is worth it is up to the person footing the bill, and that is you. I’m of the opinion that if you build the car the way you want, you will want to keep it. If you build it “for the next guy,” he is the one who will ultimately get the car. 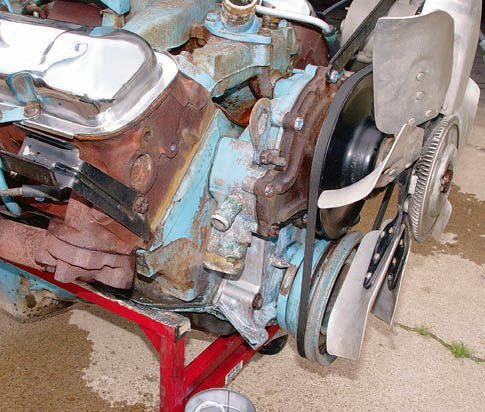 Once the engine is back together, it’s time to paint and detail it to give it an authentic, correct appearance. In addition to the paint, other areas to pay attention to are fasteners, wir­ing, and hoses. Ideally, the engine should be painted in the same manner as the rest of the car in a paint booth using a quality paint gun, proper, and safe equipment. If that is not possible, you can still get very pro­fessional-looking results with spray cans. After all, they are simply very compact, one-time use, compres­sor sprayers. But you need to be sure that the surface of the engine is clean, free of grease, and properly prepared. Make sure your painting area does not have contaminants and air flowing through it, which means do not paint your engine in the driveway. Whether using a spray can or a spray booth, the secret to satisfac­tory results is the preparation of the surfaces. Every little sanding scratch or bit of oil will show up when painted over. Surface preparation is fairly simple, but time-consuming. If you want it to look right, take the time it deserves. 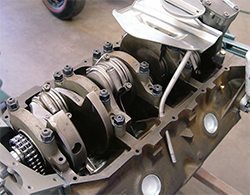 If your engine was at a machine shop, it was likely hot-tanked, but still requires chemical degreasing and a thorough rinsing. After that, a primer coat will indicate any imperfections that need address­ing. Remove all rust before any degreasing takes place. 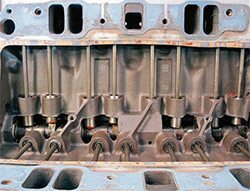 One area of Pontiac engines that requires a different approach than other V-8 engines is the exhaust port area of the cylinder heads. This area burns off paint very quickly. The reason is because the port has a 135-degree turn, which puts an immense amount of heat just before the port’s exit point right where the casting code is. At car shows you see that area almost always has the paint burned off and rust is starting to form. 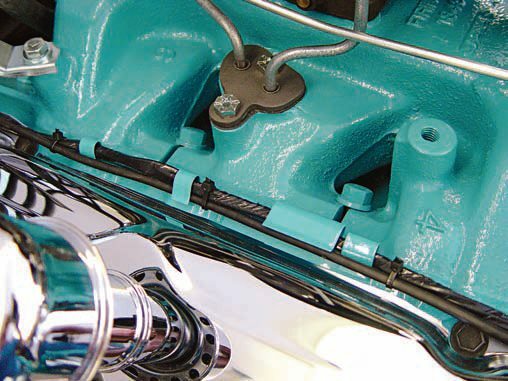 Although it seems like nothing really stops the problem dead in its tracks, many restorers and engine builders have had good luck with priming those areas with several coats of VHT header paint. The rough-cast finish of the exhaust port and the flat finish of the paint work provide a good base for top-coat adherence. If you are using a spray gun, look for a high-temperature version of the cor­rect-year engine paint for your Pon­tiac engine. 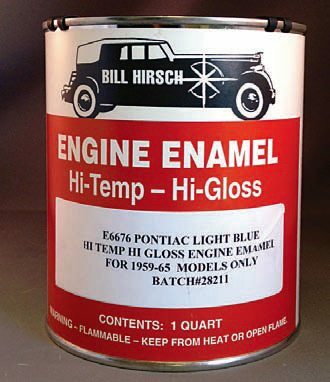 A product like Bill Hirsch Engine Enamel does a good job. 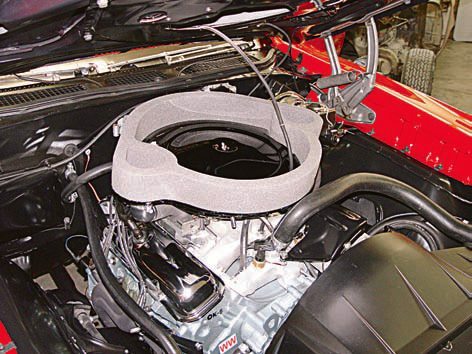 If you find that your exhaust ports are still starting to discolor after a few weeks of driving, make a template to mask off the surround­ing areas of your engine and touch them up. It generally needs to be done once or twice each season. It is just one of the little idiosyncrasies of owning a Pontiac. 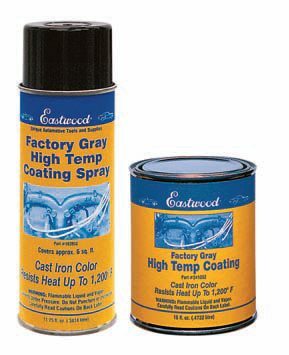 For exhaust manifolds, use East­wood’s Factory Gray Hi-Temp Coat­ing. It does a great job of replicating the color of bare cast iron without the threat of rusting like a bare metal piece inevitably does. Interestingly enough, the manifolds don’t get as hot as the exhaust port, so this paint holds up fine. Other Eastwood paints do a great job of replicating bare cast finishes. If you want to retain that fresh-cast look on aluminum and other sur­faces, check out its detailing paints. Once again, the automotive aftermarket has come to the rescue with many items that have long since been depleted from dealer inventories. Even more importantly, wearable items, such as hoses and belts, should be replaced with newly manufactured items. The reasoning is this: even if you could find one, do you want a 40-year-old radiator hose on your car? Do you want fuel lines not resistant to today’s gasolines, which contain at least 10-percent ethanol? How about old plug wires arcing between each other? No, no, and no. With companies like Ames Per­formance Engineering, Original Parts Group, Year One, and Performance Years taking the time and money to invest in the manufac­ture of quality reproduction hoses, correct clamps, distributor caps, engine wiring harnesses, wire loom separators, plug wires, Ram Air pan gaskets, and other related items, it has become customary in the last decade or so to refrain from seeking out original pieces. Instead, restorers grab the latest GTO restoration cata­logs to see who has what and who has the best deals. Again, the Pontiac message boards are great places to see what supplier pieces are better than others and which ones come from the same supplier. You’d be surprised by how much of it is the same. With any engine that has seen high-mileage and hard use, the cylinder walls show wear and sometimes scoring. This particular block shows extreme scoring and needs an overbore. Feel for a notch or a ridge around the circumference of the top of the bore. One typically develops after many miles and/ or hard use. If one has developed, the block needs to be over­bored. Any visual damage also requires an overbore. Use a telescoping micrometer to take precise measurements at the top middle and bottom of the bore. 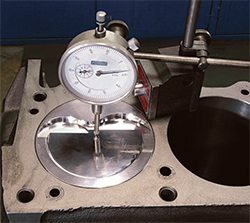 Compare these measure­ments to the stock specs to determine the amount of overbore required. 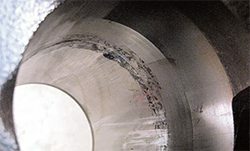 A .030-inch boring procedure usually cleans up any cylinder wall damage and allows enough material for a future rebuild. 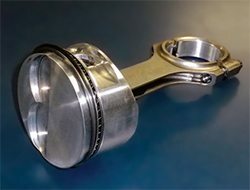 Even so, you need to determine the size of overbore before you order pistons, as another pass on the boring bar may result in pistons too small for your build. This cylinder wall has been deeply scored, which necessitates an engine overbore. Use a telescoping micrometer to measure the bore size at the top, bottom, and middle. If the block wall is too thin and it’s been overbored to .060 inch, have it sleeved or replace the block. You can go with an OEM unit or an aftermarket block that supports much more horsepower than stock. But of course, then the engine is not factory correct and the engine package is worth far less. This engine has suffered severe engine damage. 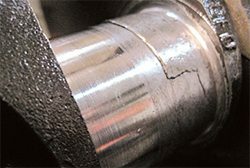 The entire main bearing is nearly worn away, and when it wore it sent metal throughout the entire engine that damaged the bearings, the connecting rods, crank­shaft, and cylinder walls. 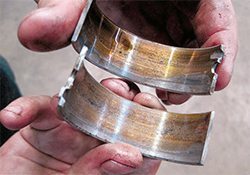 Main bearings should never look like this, and if they do, expect to see damage throughout the entire engine. Another view of this deeply scored crankshaft journal. Pontiac V-8 rod journal diameters measure 2.249 to 2.500 inches. These oil feed holes supply lubri¬cation to the main bearings. Metal from the main cap bearings have embedded in the crankshaft journals. Note that the oil holes in the crankshaft journal have been slightly chamfered. The crankshaft journals have suffered enormous damage and must be turned down. 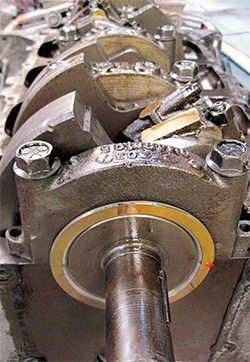 Oversized bearings must be fitted to the crankshaft. Crankshaft runout must be measured as well. When rebuilding a Pontiac V-8, you can opt for the OEM cast pistons and I-beam rods. However, if you’re horsepower target is significantly above stock, you need some high-performance engine internals, and those include forged H-beam rods and forged pistons. This piston-and-rod assem­bly can cope with up to 700 hp. In preparation for installing the pistons in the block, you need to complete the piston and rod assemblies. 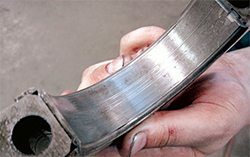 Use a piston ring tool to install the three piston rings. 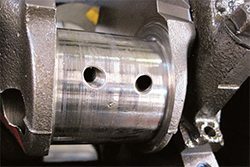 Once the rings are installed, install the wrist pin and connecting rod to the piston. The pressed pin is stock type and the floating wrist pin uses a bronze bushing. 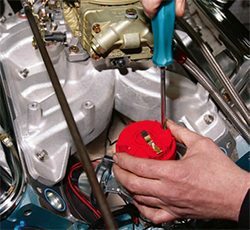 Be sure that correct clearance is achieved for the particular type of wrist pin, which means carefully measuring the small end of the rod and the pin itself. 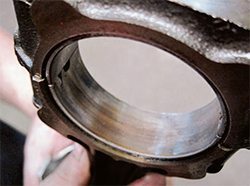 The pistons and connecting rods must match the requirements of the particular rebuild. Therefore, the rod length and big-end diameter must match the crank journal measurements. The piston must have the correct clearance to the valves. 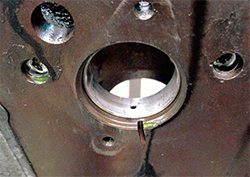 If the piston comes in contact with the valves, catastrophic engine damage will occur. The piston-and-rod assemblies have been installed through the bores. And the connecting rod caps and nuts have been installed, so at this stage, it’s time to correctly torque the rod nuts to the appropriate torque spec. First, check with the rod manufacturer for the correct torque spec. The OEM and ARP fastener torque specs are often different and incompatible, so if you use the wrong torque spec, you may strip the fasteners. The factory torque spec for connect­ing rods is 43 ft-lbs. 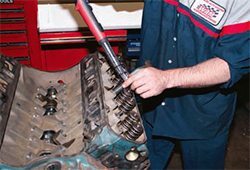 Use a 9/16-inch socket on a click-type torque wrench and torque the nuts to 15, 30, and finally 43 ft-lbs for the OEM nuts.